This product may contain mercury. Consult your local environment authorities for regulations regarding how to properly dispose of products containing mercury. Gear up with the portable Carson MM-200 MicroMax Plus Microscope. This device will readily fit into your pocket and muscle up to 60-75x of magnifying power. To deliver bright images anywhere, it also features built-in LED illumination. 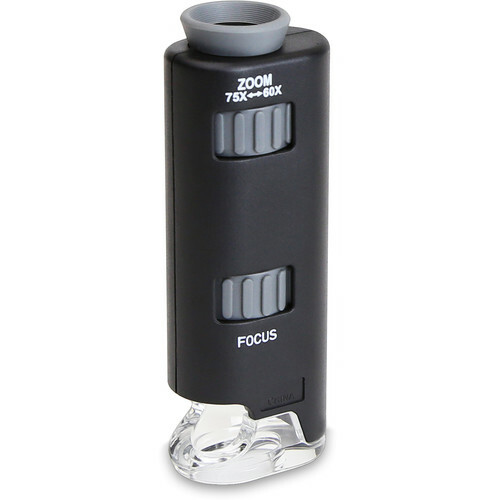 For ease of use and ergonomics, it provides dedicated zoom and coarse focus rings, a rubberized eyecup, and a built-in stand made of clear polymer. Box Dimensions (LxWxH) 3.65 x 1.4 x 1.0"
MM-200 MicroMax Plus Microscope (Matte Black) is rated 4.3 out of 5 by 33. Rated 5 out of 5 by Wlthrye d'Smegma from Great for kids and adults! I gave this to my 5 year old nephew and he love's it. Today he wants to be a scientist, yesterday he wanted to be Superman. The adults love it as well. If you get one, buy two or all the kids and some adults will be trying to get a turn to use it. It works just as advertised. There's a whole world we never see with our naked eye. The portable microscope opens that new world up. Rated 5 out of 5 by Anonymous from Does what it needs to do This microscope is useful for viewing things on flat surfaces and even more free structures, such as leaves on a plant, if you can stabilize the microscope properly with your hands. The light it is very useful for viewing and the compact size is smaller than I had imagined, easily fitting in my jean pocket. It's plastic, but mine has not broken for over two weeks of use about every other day or more. Rated 5 out of 5 by snowj720 from great microscope at a steal try to find something comparable to this on the net and you'll be spending many times more. this little guy does the trick, bugs look scarey. works great for tri's. make sure to get the one w/ the led light, it's better on batteries and i think the light spectrum is truer. you do have to have a steady hand to use it, but if you want steady, go buy a stationary micro. Rated 5 out of 5 by Seattle Botanist from Better than expected I figured for the price that it would be a cheap/ineffective microscope.....I was wrong. This product was much better than expected. Powerful microscope, clear lens and picture and the led light helps illuminate your subject - and all at a size that fits in your pocket comfortably. I ended up buying a few others to give to colleagues. Rated 4 out of 5 by Oso Apicultor from Great Value! Great value on this handheld microscope! PROS: Easy to operate - bright LED light - compact size, fits in a shirt pocket. CON: clear plastic lens comes off easily - hope it doesn't break on me! Rated 4 out of 5 by Anonymous from Excellent little microscope This is a great little gadget for an introduction to the microscopic world. The zoom is only 60-100X and I was startled at how small it is, but I have enjoyed scouting out new things to look at! Rated 5 out of 5 by BenDiesel from Exactly what I needed I needed a small handheld portable microscope and this one is perfect. I ordered on a Friday and it came in the mail on a wednesday, so very pleased with that as well. Two thumbs up. Does this have 20x40 magnification? Yes the model zooms from 60x-100x Magnification.